Heartis Village North Shore in Glendale, Wis., was named a winner in the prestigious national HREI Insights Awards™. GLENDALE, Wis., and DALLAS, Jan. 21, 2019 – Since the late 1990s, several unsuccessful proposals had come and gone to redevelop a former brownfield site on the west side of the Milwaukee River, just north of Milwaukee. In addition, an undetermined number of other would-be developers passed on the property over the years, settling for easier, less challenging locations. Not so for the creative, resolute team at Dallas-based national healthcare real estate firm Caddis®. In fact, the Caddis team’s persistence and creativity in the development of the new Heartis® Village North Shore senior community on that brownfield site just earned the firm a national award. Recognizing how the Milwaukee River could become more of a community asset, city officials have been working since the early 1990s to redevelop the former industrial site overlooking the waterway – acquiring and demolishing vacant industrial buildings, conducting environmental clean-up, and adding roads and infrastructure. 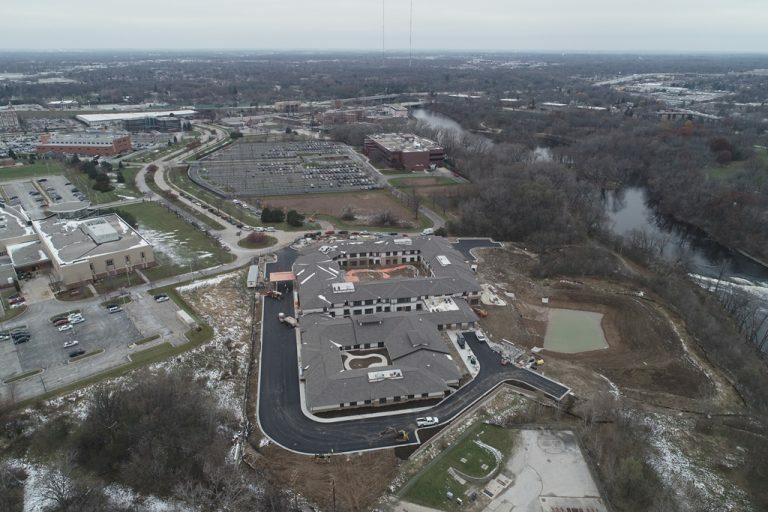 As part of that, they established Estabrook Corporate Park in the northeast quadrant of Port Washington Road and Estabrook Boulevard, and successfully redeveloped most of the 110-acre commercial district. Caddis officials were convinced that the riverfront site had excellent potential and they were determined to succeed where others had fallen short. The award-winning Heartis Village North Shore in Glendale, Wis. (top) is scheduled for completion in early 2019. Caddis executives (bottom) accepted a 2018 HREI Insights Award for the project Dec. 6 in Scottsdale, Ariz. Pictured (left to right) are Jud Jacobs and Jason L. Signor. Caddis put the property under contract and began navigating the challenging development process. 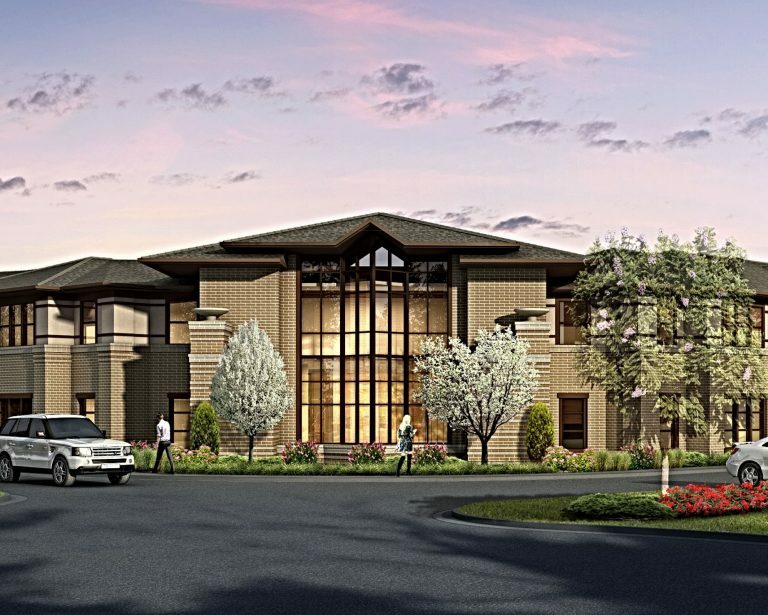 The Heartis® Village North Shore project was approved in spring 2017, Caddis closed on the property acquisition shortly thereafter, construction began in October 2017, and completion is slated for early 2019. Located at 100 W. River Woods Parkway in Glendale, it’s just five miles north of downtown Milwaukee. The new community is situated in an attractive area on a quiet cul-de-sac with excellent access to local healthcare services. The interior includes a host of amenities, including an elegant piano bar, wellness suite, library and media room. In addition to beautifully landscaped grounds with gardens and walking paths, the land accommodates space for an over-sized courtyard that features a patio, fire pit, dog park and putting green. To capitalize on the proximity to the Milwaukee River, Caddis built an Americans with Disabilities Act-compliant walkway to the river for easy access by residents. Heartis Village North Shore will be managed by Pathway Senior Living LLC, a Chicago-based company that operates senior living communities in Wisconsin, Illinois, Kansas and Minnesota. The architect for the project is Austin, Texas-based Katus, and the general contractor is Stevens Construction Corp., which is headquartered in Bloomington, Minn.
Caddis projects and executives have been named Finalists 14 times and Winners five times in the past six years of the highly competitive HREI Insights Awards. 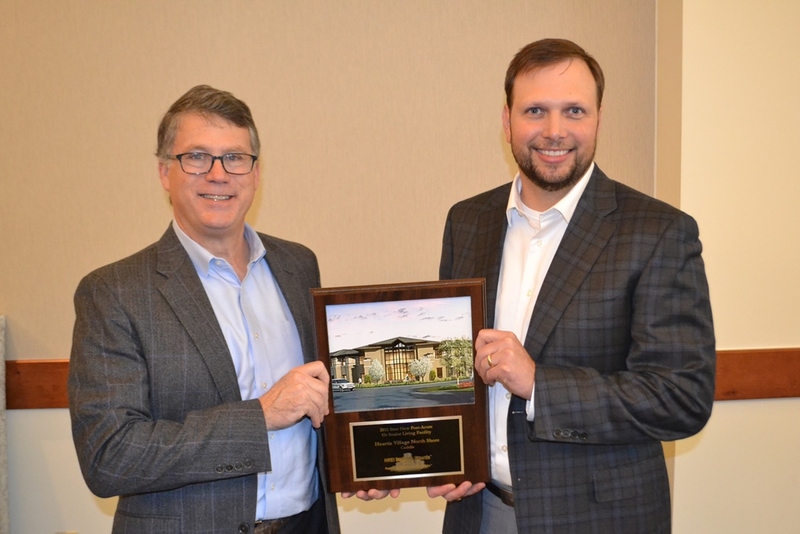 Previous Caddis Winners include Lone Star Family Health Center in 2013 for Best New Medical Office Building (50,000 to 99,999 square feet); Heartis Amarillo assisted living and memory care community in 2015 for Best Post-Acute or Senior Living Facility; Heartis Clear Lake independent living, assisted living and memory care community in 2017 for Best Post-Acute or Senior Living Facility; and Jason L. Signor in 2016 as Healthcare Real Estate Executive of the Year. 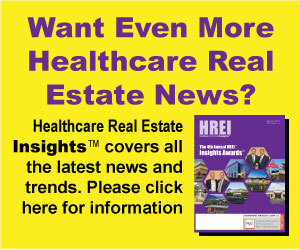 Established in 2013, the HREI Insights Awards™ are the only national awards dedicated to recognizing excellence in the areas of healthcare real estate development and executive leadership. The awards a presented annually by Healthcare Real Estate Insights (HREI) magazine, launched in 2003, which was the first and remains the only national media organization entirely dedicated to covering healthcare real estate development, financing and investment. For more information on HREI or the HREI Insights Awards, please visit HREInsights.com. Caddis® is a national real estate development, management and investment firm focused exclusively on healthcare real estate. The firm is comprised of experienced real estate professionals across various disciplines that provide clients with expertise in development, acquisition, financing, construction management, leasing, tenant representation, property management and accounting. Since its inception, Caddis has developed or acquired over four million square feet of medical assets valued in excess of $1 billion. In its annual Construction and Design Survey, Modern Healthcare magazine recognized Caddis as the 9th largest healthcare development company in the United States. For more information about Caddis, please visit www.Caddis.com. Follow us on LinkedIn at www.linkedin.com/company/caddis-partners Add our Facebook Page?